Visitors to CRE North posted prayers for Brexit the day after Prime Minister Teresa May saw her latest Brexit Agreement with Brussels defeated in Parliament. 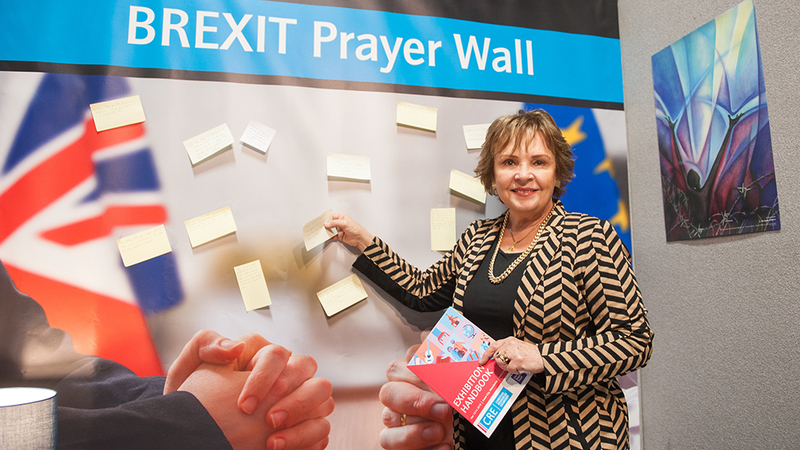 The Brexit Prayer Wall was CRE’s response to the Archbishop of Canterbury’s call for five days of prayer in the approach to Brexit. Dana, a former MEP, was among the many who posted prayers. The Brexit prayers are listed below, warts and all, just as they were written. • Please bring the power or reason to all involved in the negotiations for Brexit. • Please bring your light and truth into our country and into decisions made. May they be godly decisions honouring to You. • We lay before You the life of our nation and long for your gentle rule to be established here. • Where there is division we call upon you for unity, where there is hate please bring love, where there is selfishness, bring selflessness, where there is greed, bring generosity, where there is hopelessness bring hope, where there are lies, bring your truth, and where there is darkness bring Your light Almighty God. • Deuteronomy 4:7 ‘For what great nation is there who has a God so near to them as the Lord our God is to us in all things for which we call upon Him?’ Lord may we as a nation call upon you. • We pray that you would grant truth and compassion to the media as they report on Brexit. • Father God we call out for Your Holy Spirit to work and dwell in our land and in our leaders. • In this time of change and trauma lead us by your Holy Spirit, we pray. Give wisdom to our politicians and leaders. • Lord thank you that you know what is going to happen. May Your church be a light of peace and reconciliation in Jesus’ name. • We pray for God fearing, righteous leaders. • Lord grant our leaders wisdom and wide vision. Defeat the darkness of division and xenophobia. Bring peace, hope and love. • Lord so many people feel fearful of what the future holds would you help Your Church to be a community where all feel welcome, heard and loved. • Lord we know that Brexit will cause some disruption and realignment here and in Europe, we pray for this to be achieved with understanding, patience and with a sense of common purpose. • We pray that God’s wisdom and strength will guide us and His Holy Spirit fill the nation. • Lord please bring Brexit to pass and grant greater freedom to Your Church. • Show your church the truth about Brexit. • Job 12:13 ‘True wisdom and power are found in you God.’ Please bring your wisdom and power to those serving in our government. • Please bless all those who work in government. • Lord may Your Will be done in our country. • Dear Lord, please have Your way. • Lord, speak to your church in the UK – so they cry out for mercy and grace for the UK. • Dear God in whom we find true love, mercy and compassion would you help us as we take our next steps in the Brexit decisions. May we strive to love each other, to embrace our differences and show respectful kindness to all. • We pray that God will have His way and bring peace and security to our country and that democracy is respected and businesses can have surety in how to proceed. • Dear Lord, please guide all involved in making the right decisions, not just for Britain but for all nations. In Jesus’ name. • We pray for unity. • Wisdom, hope, peace, God’s fingerprints in it. • Lord please grant Teresa May humility and clarity of vision. • Loving God you were wounded and broken for us. Help us to bind up the wounds in our nation and bring us your peace and wholeness. • God heal our land. • Turn the will of the people to Your Will. may Your way rule, govern and protect this land. • Daniel 9:4 ‘O Lord, the great and awesome God who keeps his covenant of love with all who love him and obey His commands, we have sinned and done wrong, we have been wicked and have rebelled, we have turned away from your commands and laws.’ Forgive us Lord. • May your will be done O Lord in our land. • Lord we pray for wisdom for our government. • Micah 2:13 ‘The Lord breaker goes before me.’ Let our country ‘break’ through this confusing situation and move according to Your Will O God. • We pray for healing on all sides as we break off from the European Union. • Dear God grant humility and strength for all working in Parliament as they represent their communities. • Lord Jesus please be with our ministers in Parliament at this time when our country is in such need of your wisdom. We pray for the outcome you would have. • Let’s be free and trust God. • Father God grant wisdom and vision for the Prime Minister and Party leaders as they negotiate the political future of our nation. • We pray for our leaders, that they will lead wisely, listen attentively, exercise grace and know peace in their deliberations. Guide them as they make decisions about future relationships with Europe. • Lord, we pray that your will be done and that your kingdom becomes evident during these trials over Brexit. Let people know You are in charge. • Lord – 1 Timothy 2:2 – Lord we pray for leaders, for blessings on all, those with whom we agree and those with whom we don’t. • Lord, please break us from the idolatry of nations, end the sin of injustice and turn our eyes and hearts to you. • Lord we pray for wisdom as to how the borders are to be reclaimed and re-established. • Please bring us through the chaos of Brexit. May Your Name be honoured once again in this land. Your will for us to be done. • Please Lord, help our way forward to Brexit. • Gambling with millions of people’s lives and livelihoods is a sin. Tearing down bridges and building barriers is a sin. Brexit is a sin. Good Lord, bring repentance and deliverance for Brexit.